Justice Ajay Manik Rao Khanwilkar, Justice Dhananjaya Y. Chandrachud, Justice Ashok Bhushan, and Senior Advocate Nageswara Rao were sworn in on Friday as Judges of Supreme Court of India. With these appointments, the total strength of the Supreme Court is now 29, as against the total strength of 31. However, Justice Nageswara Rao’s is only seventh such appointment made under Article 124(3) (b) of the Indian Constitution. 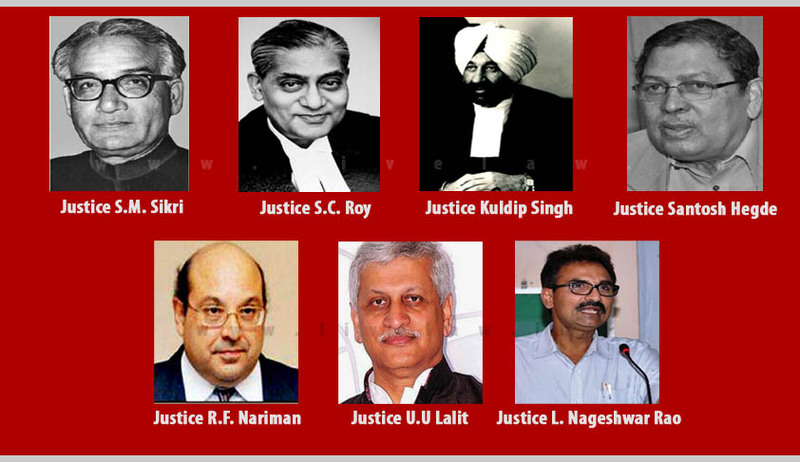 The last such direct appointments from the Bar were that of Justice Rohinton F. Nariman and Justice U.U. Lalit after a gap of 15 years. Justice Sikri was appointed to the Supreme Court in February, 1964 and served as the Chief Justice of India from January 1971 to April 1973. Justice S.C. Roy was appointed judge in 1971 and he died after holding the post for four months. In 1988, Justice Kuldip Singh was appointed directly from the Bar. He retired in December 1996. Three years later in January 1999, Santosh Hegde was appointed Supreme Court judge and he retired in June 2005. The trend is claimed to have been different during the British Raj. In the High Courts of colonial India, only one-third of the seats of the Bench were reserved for members of the lower judiciary, who usually belonged to the Indian Civil Service. The remaining two-thirds of the Judges were practising lawyers before their elevation. For instance, in 1908, the practising Advocate General of Bombay, Basil Scott, was directly made the Chief Justice of the Bombay High Court. Judges to Federal Court of India were also appointed from the ranks of practicing lawyers. However, in the final decades of the British Raj, when prices began to rise and judicial salaries remained what they had been in the 19th century, successful lawyers started declining High Court judgeships. Mr. Abhinav Chandrachud, Bombay HC Advocate and son of Justice D.Y. Chandrachud hence calls for reforms in the Indian Judicial Appointments, so that any possible inhibition that may be displayed by a member of the Bar can be taken care of.